Duane Langenfeld started doing hail damage and paintless dent repair over twenty years ago. In 2011 he started his life's work, Jabuti Hail, based out of Rapid City, South Dakota. The paintless dent repair industry relied on 3 main techniques - until Duane had a better idea. Enter Ding Tool - Duane's brand-new company and end-use tool of the same name that increases efficiencies up to 30%, turning over jobs more quickly, growing revenue, and adding profit to the bottom line. The B9 Core Series and Rugged - Nylon 6 resin was the duo that brought it to life, so Duane could iterate in-house without waiting quadruple the time on a third-party outsourcing company. For someone that's been doing paintless dent repair for 25 years, Duane says the industry relies on three main techniques: getting a tool in behind the panel and massaging dents out, glue-pull the dents out, or tap down on high areas outside the panel. Ultimately, the best technique becomes a matter of finding a tool that's the most efficient, which allows businesses to grow revenue and turn over jobs faster, a critical metric to insurance companies. That need - for efficiency, more revenue streams, and faster throughput - gave rise to Ding Tool, Inc., last year. The tool is so innovative and novel, he's already filed a patent. And without a faster alternative on the market, Duane is set to capture worldwide demand. "I needed the ability to rapidly prototype each iteration as I went along, and the B9 Core Series 550 gave me the ability to do that. Literally I can print something off, go back to work, then as the next iteration comes along, I can cycle it in at that time. Outsourcing triples or can even quadruple my wait time for each design iteration. That's what made this printer purchase to bring production in-house so valuable." 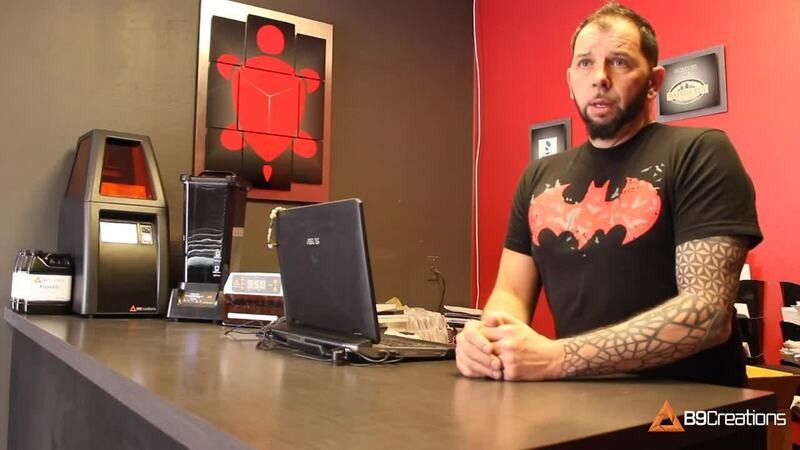 Keeping the 3D printing process in-house allows him to gain back control of his timelines. Outsourcing the Ding Tool to a third party that does 3D printing or CNC machining triples or can even quadruple Duane's wait time for each iteration. Now he can get multiple iterations done all in one day. B9Creations high-speed Gray design resin has the properties needed to prototype products and test the form and fit of Duane's tools. But it was Nylon that was used most prevalently in Duane's industry. B9Creations new Rugged - Nylon 6 engineering resin allowed Duane to take his prototype one step further into a functional end-use part that will hold up to rigorous testing, straight out of the 3D printer. With high impact resistance, Rugged - Nylon 6 is tough enough to stand up to repeated hammering, taking out dents without leaving scars on the paint or metal - key to successful paintless dent repair. What's the impact on the bottom line? "Even if this tool is given to a new technician, they'll gain a 20% to 30% increase in speed. I went through 8 or 9 dents in a roof even with a rough, early prototype of this tool in 20 or 30 seconds - printed in your Rugged resin." 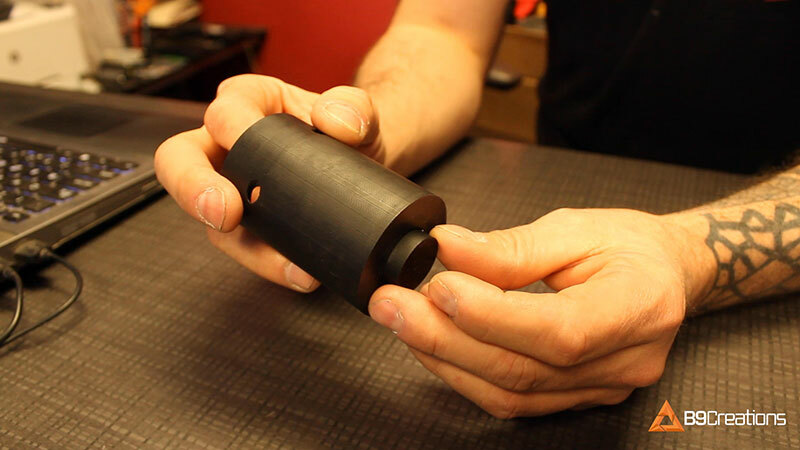 Duane's Ding Tool has several different iterations he has to print and reprint, testing each prototype and iterating on the design to deliver the best product to market. Simplicity and efficiency have been crucial in streamlining the printing process so he can continue to run his main business, Jabuti Hail Repair, while he finalizes his Ding Tool design and brings it to a global market. "Once the print file is in the library, the process is literally one of less than 5 button pushes and you're printing." Post-processing can be a tedious task that disrupts your workflow. In some cases, Duane was setting aside an hour for cleaning one print by hand. Incorporating the B9Clean automated cleaning unit into his post-processing speeds up his workflow, saving him time and money. In short, he can now pair production-grade parts with post-processing to match. "Cleanup was probably my biggest issue. If there was something that was slowing me down with each iteration, it was actually my cleanup. It stopped me from printing at times because I didn't want to spend the amount of time doing it by hand. The B9Clean, automated cleaner, is going to reduce my time and speed up the process quite a bit."